What you’re looking at above is the first-ever Aston Martin Huubrid (watch the video below) plug-in hybrid built by German auto parts juggernaut Bosch. The car is a radical concept car that started life as an Aston Martin DB9 and was converted over to 6.0-liter V12 plug-in hybrid, making it the first all-wheel drive Aston ever. With 740 horsepower, the hybridized DB9 can make a 0-62 sprint around 20 percent faster than the 4.2-second stock version, according to Motor Authority. Intriguingly, the hybrid DB9 only weighs 660 pounds more than the stock unit. 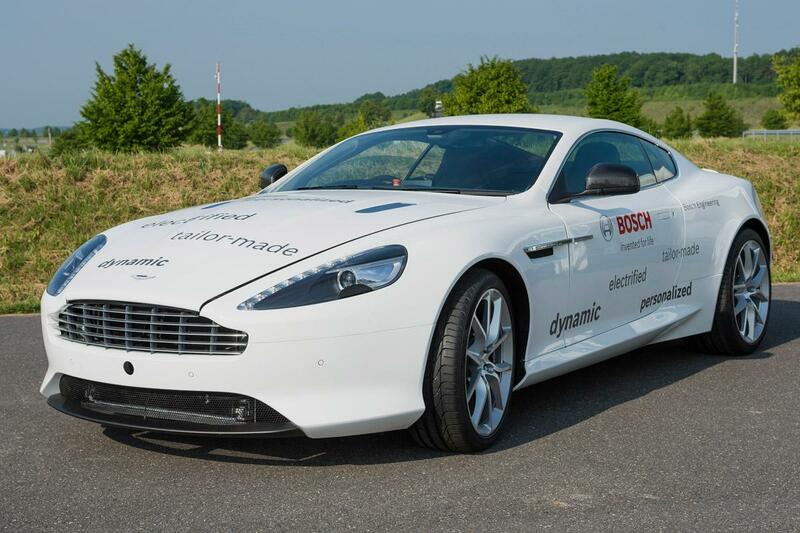 Bosch built the plug-in Aston to prove that modular hybrid technology can be achieved – as can eco-friendly supercars. Bosch added some lithium-ion battery packs and two electric motors to the DB9. The stock V12 powers the rear wheels while the new electric motors power the front. As you might expect, the front motors can accelerate and brake each wheel individually, improving handling. The system is extremely precise. It will even take into account the number of passengers in the car and the tire temperature when calculating power flow. Bosch didn’t just fiddle with the mechanical bits; it also added a touch-screen display on the inside so the driver can monitor the vehicle power flow, indicating which wheels were powering the vehicle, and watch the status of the battery charge levels. While we had a good giggle with the video host’s pronunciation of the word “hybrid,” we’re rather glad someone other than McLaren or Ferrari is putting plug-in hybrid technology into a supercar application. Will Aston Martin take the hint and build one of its own?